HomeNewsProspective Plantings: High-Water Mark for Corn? USDA’s end-of-March Prospective Plantings report always brings a few surprises. This year will likely be the same, when USDA releases its report at 11 a.m. CDT on Friday, March 29. The big question will be, how much water do these acreage estimates hold? Flooding is happening from Canada to Missouri and from Nebraska to Indiana, and the stage is set for record flooding from now through May. Around two-thirds of the 48 contiguous states are at risk for flooding, according to experts in a recent Bloomberg article. 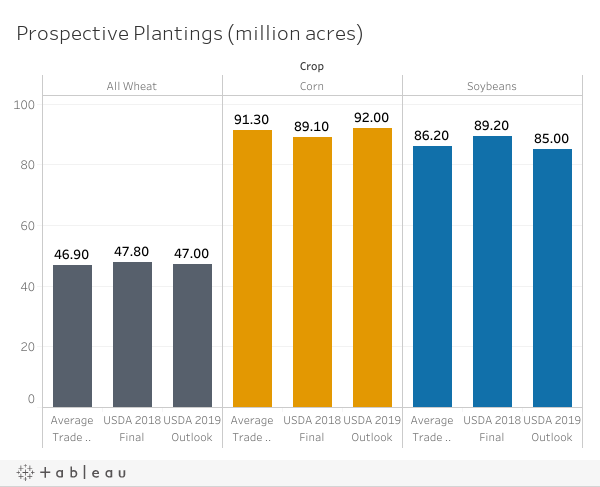 At its annual Agricultural Outlook Forum in late February, USDA forecast U.S. farmers will plant 92 million acres of corn, which is a 3.3% jump from last year, and 85 million acres of soybeans, which is down 4.7% from last year. Gulke says the Prospective Plantings report will likely be the high-water mark for corn and the low-water mark for soybeans. Gulke says this scenario should be friendly to corn. After this week’s report, he says, weather will become the market’s focus. Gulke will analyze the Prospective Plantings and Grain Stocks report on Friday, March 29. Visit agweb.com/Gulke. I have to agree with Gulke this time. This report was from surveys done in February, before the bomb cyclone. Is NASS going to look at what's happened and make adjustments? Farmers can get a lot of acres sown quickly, but a lot of prep work that's normally done in the fall or in that week in February when temps are spring-like didn't get done this year. Mother Nature is in control and she seems a little spastic this year.